The trial in the Court Martial of Welsh-American WikiLeaks Whistleblower Bradley Manning is finally scheduled to begin on Monday 3 June 2013 at Fort Meade, Maryland, US after an unprecedented three years of pre-trial detention. The mistreatment of Bradley Manning in prison including almost a year of torture by the US authorities that was condemned by the UN Special Rapporteur on Torture has to be seen in the context of the vast, 'secret' Grand Jury conspiracy and espionage investigation into WikiLeaks and the pressure that must have been exerted on Brad in a sustained but ultimately unsuccessful attempt to persuade him to testify against Julian Assange, who the US authorities very badly want to get their hands on. Read or listen to Bradley Manning's statement to the court (extracts below) and his chat logs to see why he felt that the information he found himself in possession of should be shared with the world and what he hoped might happen as a result of risking his life and liberty to do this. There are 22 charges against Brad including 'Aiding the Enemy' that potentially carries the death penalty although the prosecution has said it will not seek this sentence. Brad has already pled guilty to 10 lesser charges that could themselves result in a 20 year jail term and the government has accepted his lesser plea on just one count but not on any of the other lesser charges, for which it will still bring evidence. During the final pre-trial hearing on 21 May, Judge Lind announced that portions of the trial dealing with 24 witnesses, including US Ambassadors, will be held in closed session, with redacted transcripts provided afterwards. The US, aided and abetted by Britain, is pursuing a permanent 'War on Terror' and continues its project of creating and escalating conflict around the globe at terrible cost to human life. The significance of the anti-war actions of Bradley Manning and Julian Assange can be judged by reference to the zeal with which both are being persecuted by the US authorities and the extent to which they have been variously misrepresented, vilified, smeared, ridiculed or ignored in the mainstream media. As anti-war activists or war resisters, they deserve our support and solidarity. Join existing or create your own solidarity actions on Saturday 1 June and throughout Brad's trial, expected to last into August unless there's an early plea deal. 1 June solidarity is currently planned for London and Cardiff. On Monday 16th July 2012 Smash EDO held a Citizen's Weapons Inspection' of EDO. 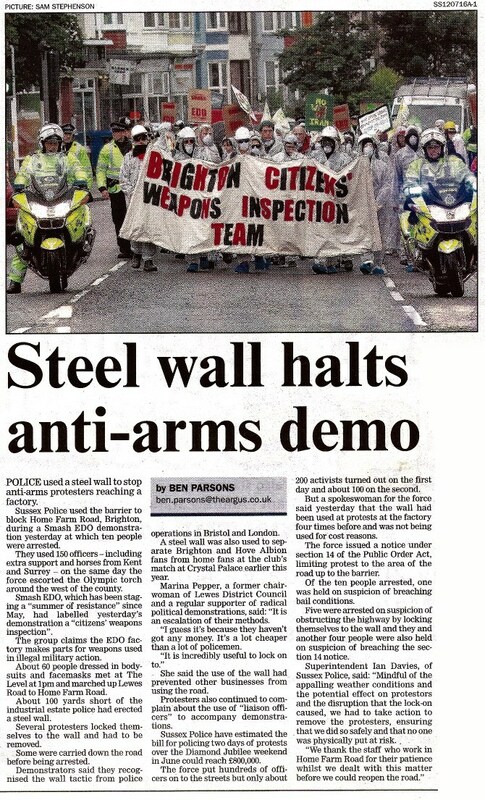 Kent, Sussex and Hampshire Police used new Police Liaison Officers and a steel wall against demonstrators. Despite this, activists dressed in white suits managed to breach the police cordon and hang banners outside the factory gates and close down the industrial estate by locking-on to the police cordon. On Sunday 15th July Smash EDO hosted a gathering against the G8, launching a new network. There will be a workshop to plan action against the G8 at Earth First and the next gathering will be 22nd September in Birmingham. At 1pm on Monday 16th July a group of concerned citizens from Brighton and beyond will be attempting to inspect the EDO MBM factory in Moulsecoomb to further highlight the factory’s complicity in the murder of innocent civilians around the world. It has long been known that this local company has links with illegal and immoral arms deals and Smash EDO intend to hold them to account. In January 2009 six activists broke in and successfully decommissioned the factory and then waited to be arrested by the police. At their later trial a jury found that their actions were entirely legal as they were acting to prevent war crimes against civilians in Gaza. This mass action is part of an ongoing 'Summer of Resistance' which has seen almost daily actions by protesters against the factory in May and June and which will continue until the end of July. Demonstrators will converge at the Level at 1pm. A call has been made to FITwatchers to kettle the police and to sabotage their new tactic of using Police Liaison Officers to pacify the crowd. The UK antimilitarist movement is building fresh coalitions against new developments in state militarism. In March activists converged in Bristol to confront an unmanned drones conference and a ‘Disarm the National Gallery’ campaign was launched in London to end arms trade sponsorship of the gallery. This week delegates visiting the annual Counter-Terror conference were met by a counter-protest and Vince Cable's speech at the UKTI conference was disrupted. Smash EDO, who have campaigned to shut EDO MBM down for eight years are launching three months of action, from May 1st to August 1st, next week with a mayday noise demonstration, a bad music demonstration and a phone and twitter blockade to name just a few of the planned events. And in Scotland, Faslane peace camp are calling for 30 days of action against Faslane nuclear base. Ever keen to get an up close and personal look at the world's most troubled regions, SchNEWS was fortunate enough to sweet-talk Brightonian Al Jazeera journalist, Medyan Diarieh, recently returned from reporting in Afghanistan. As a Palestinian who has extensively covered the conflicts in the occupied Palestinian territories, Iraq and Turkish Kurdistan for many years, he's a man with a useful perspective on events on the ground in what's become Britain's longest war since the days of Empire. Medyan has become a well known figure amongst pro-Palestine and anti-war protesters, informing the public in the Arab-speaking world of the UK's solidarity movements. Interviewer: So what was it like arriving in Afghanistan? Medyan: When I arrived in Kabul I could see even from the plane that it is a very poor city. When you walk from the airport you can see Turkish army and American armies, but the airport is very small and the electricity is cut off for half an hour at a time. Once I went to the street, I knew everything about this country. There is no life at all. The electricity is sometimes on sometimes off, no clean water, no sanitation at all. And this is in Kabul. Outside the city is nothing, most people don't know what a cooker is - they just cook on wood. Most of the roads in Afghanistan have not been concreted. The water you see on the street is sewage water coming from the houses since no proper sewage system is in place. Some of the streets I visited have a stream of dirty water running, and they are really hazardous. The houses are very poor. This is Afghanistan. Is Canada Guilty of War Crimes? Why was a Sunday Times report on US government ties to al-Qaeda chief spiked? Iraq: Was it Worth It?...Are You Kidding? Camp Bastion attacked - heaviest US air loss since Vietnam. Barbara Tucker Arrest 45: The Paranoid State. Theresa May and Al-Qaeda's "Assurances"
XE's Raymond Davis, Afghanistan, Libya, opening shots of World War III?